产品优点�U TAMOL SN is an efficient and economical dispersing agent with applications in many industries. 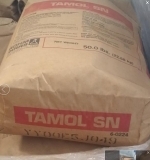 TAMOL SN is a tan free-flowing granular material readily soluble in water. For use as a secondary dispersant in rubber production. For use as a treating agent within paper mills for recovering tall oil.